Hello! We're back with Day 3 of our Flower Favorites blog hop. 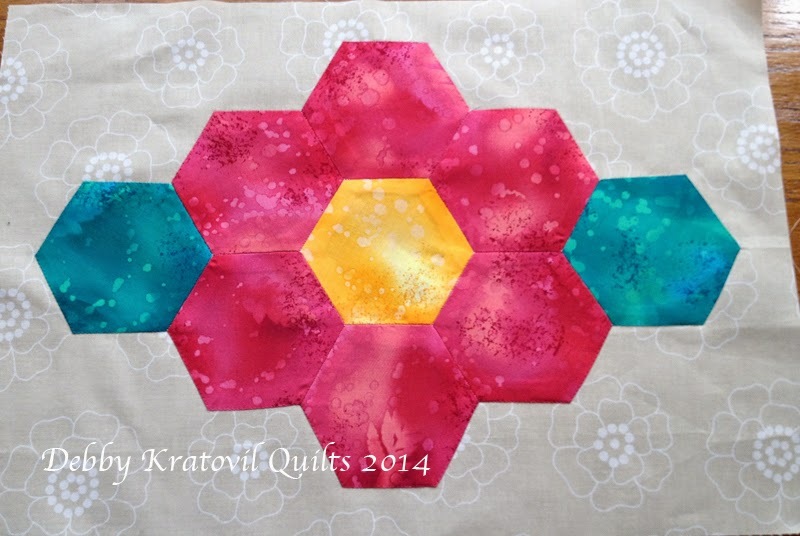 We're featuring blocks made with flower fabrics and/or blocks that are themselves flower-themed. We're excited to share these tutorials with you, and hope they'll inspire your next quilt, wall hanging, or table runner! 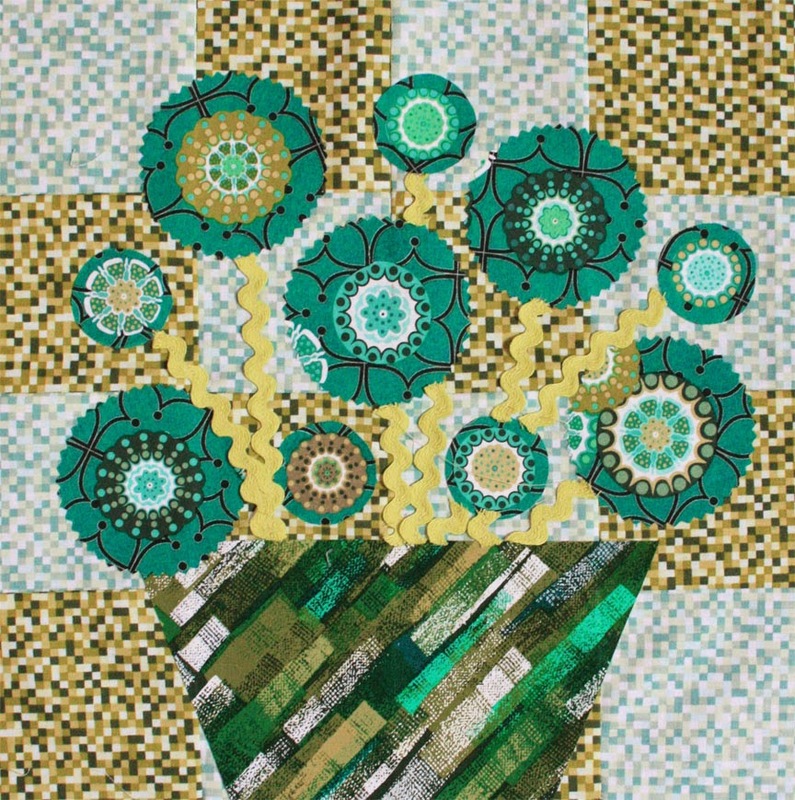 Today the Benartex Blog Design Team is using the Palazzo collection by Greta Lynn from Kanvas to make a modern version of a basket block, using fussy-cut fabric as flowers. 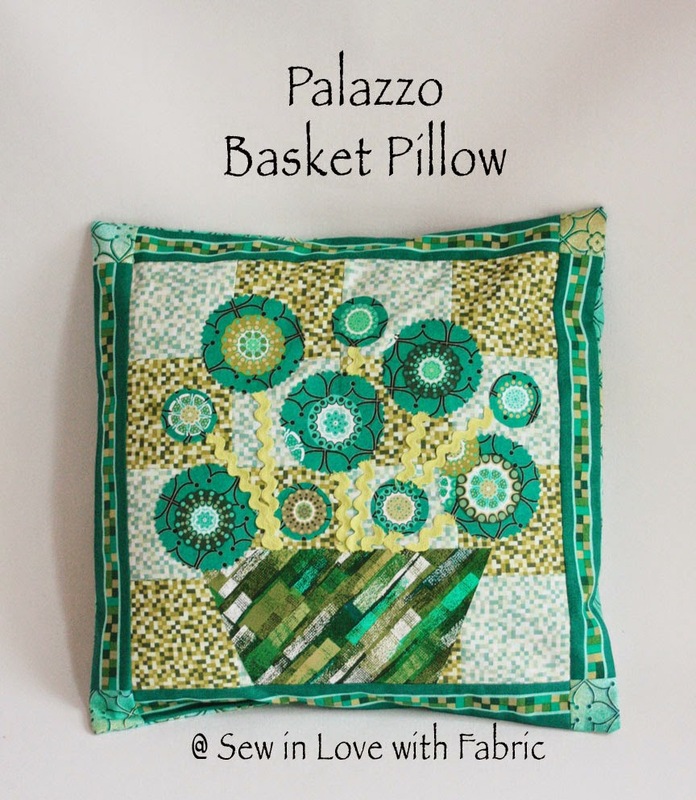 Keep reading for the tutorial, for directions on how to turn the block into a throw pillow and to find out how you can win some Palazzo fabric for yourself! 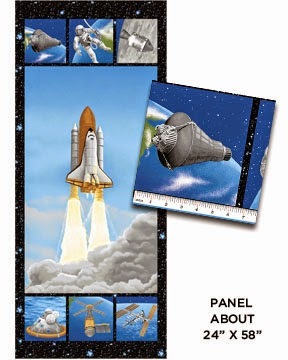 From each of the 2 pixelated prints, cut two 3-1/2" x 21" strips. 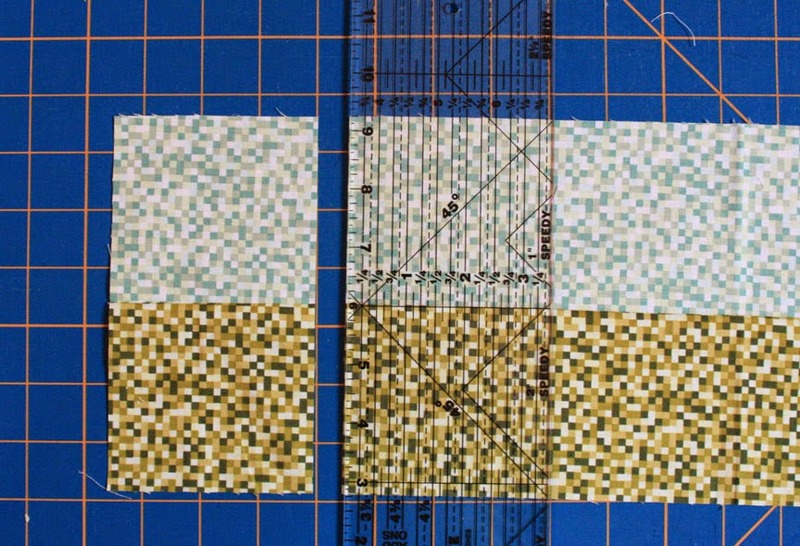 Sew a light aqua and a green pixelated strip together lengthwise. Make 2. Crosscut into a total of eight 3-1/2" wide segments. 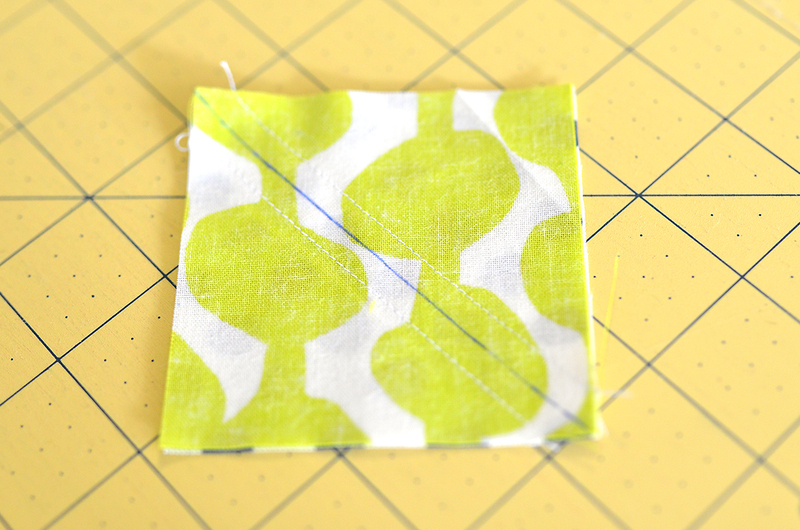 Sew 2 segments together to make a four-patch. Make 4 four-patches. 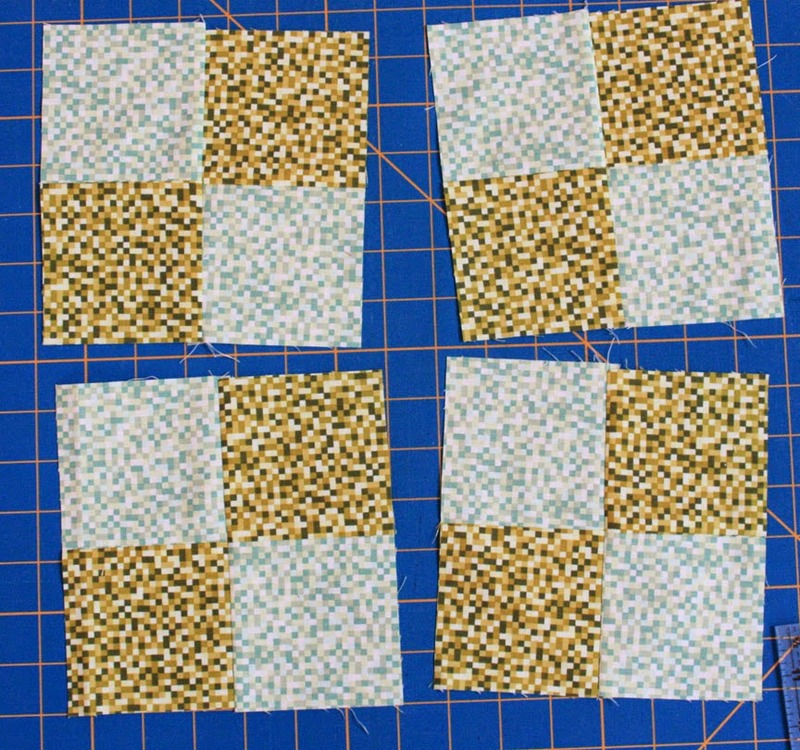 Sew the four-patches together to make the 12-1/2" square block background. Trace four to six 2-1/2" diameter circles and four to six 1-1/2" diameter circles onto the paper side of fusible web (Hint: We used the bottom of a can of basting spray for the large circle shape and the bottom of a spool of thread for the small circle shape.) 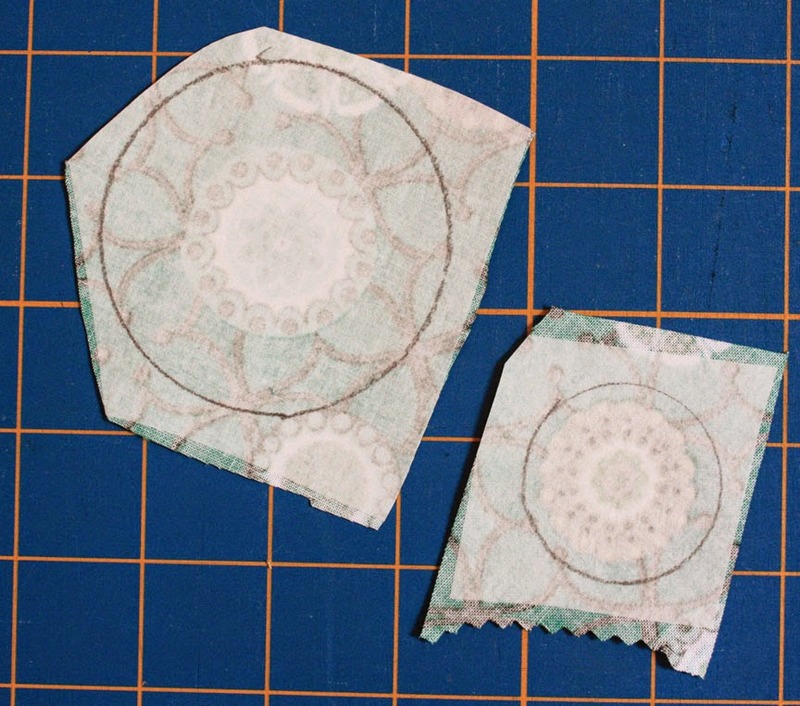 Cut the circles out roughly and fuse to the wrong side of the fat quarter of dark aqua small medallion print, center a medallion within each circle. Cut out each circle on the drawn line. Cut one 5" x 8-1/2" rectangle from the diagonal mesh print and one 4-1/2" x 8" rectangle from the fusible web. Fuse to the back of the diagonal mesh rectangle. 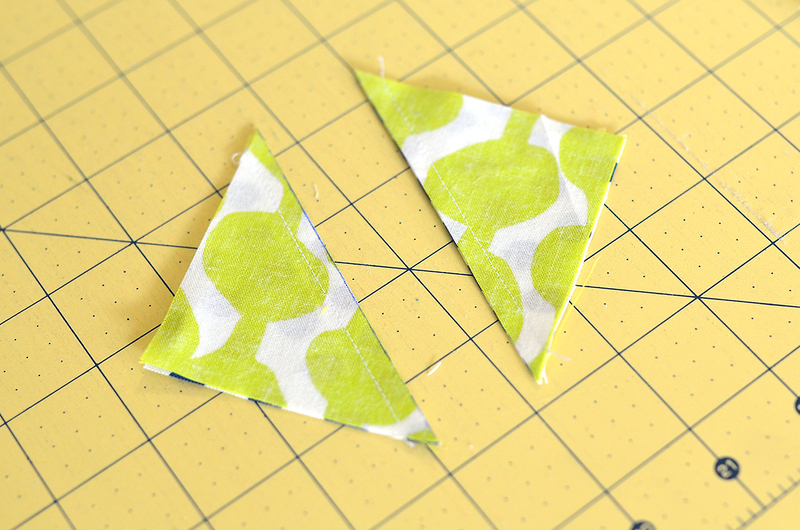 Trim the fabric to the fusible web size. Measure in 2" from each of the bottom corners and draw a line from the corresponding upper corner to the mark. Cut on the drawn lines to make a basket shape. 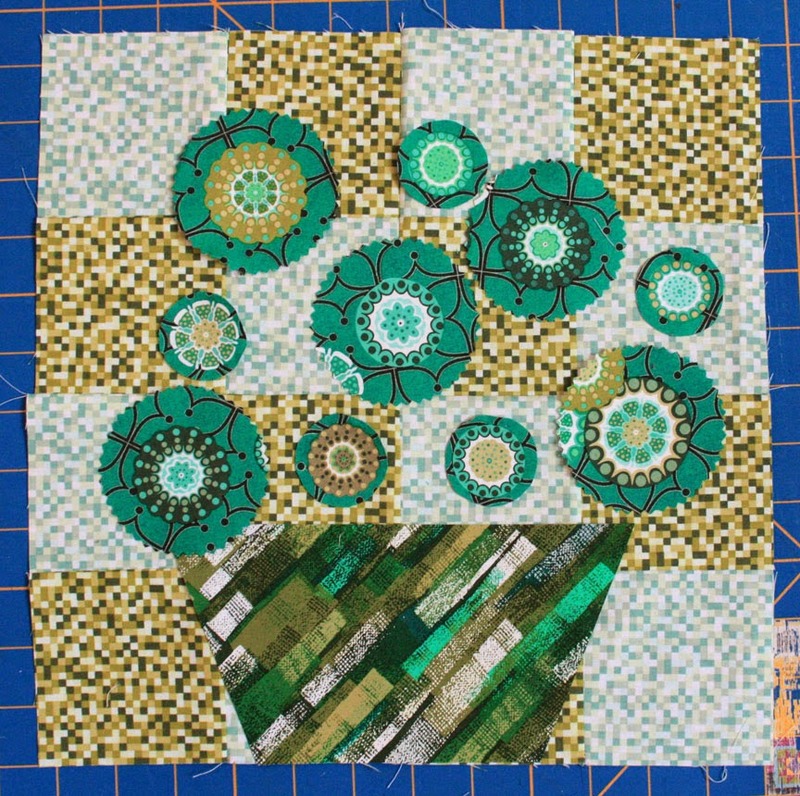 Lay out the basket shape and the flowers on the block background. Play around with placement until you are satisfied. You may prefer to trim the basket bottom slightly if it's too tall for all the flowers you add. Fuse the flowers and basket in place and stitch down the center of each rick rack stem to secure. Stitch around appliques to secure. 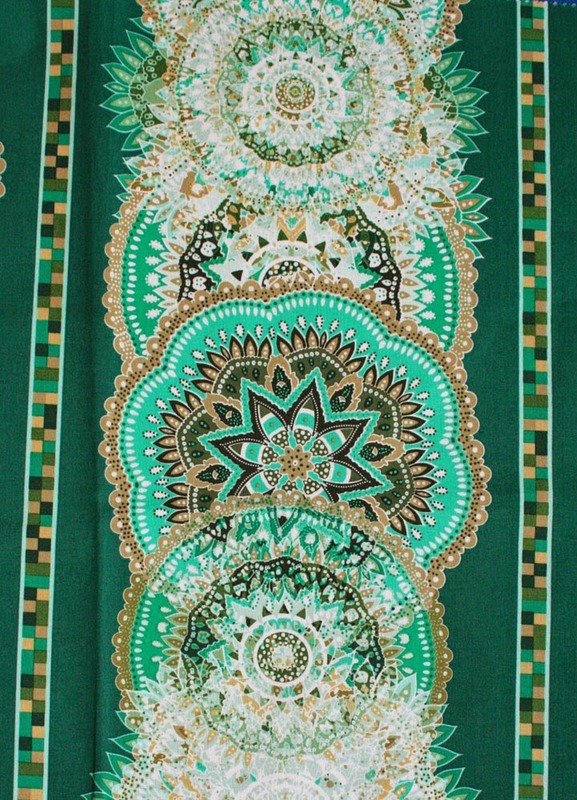 Here's a look at the large medallion border print. For the pillow, we're just using the little check border (but don't worry...we have a bonus project showing you how to use up the rest of this gorgeous print! Scroll to the bottom of this post for more information). Centering the check border, cut four 2" x 12-1/2" strips. 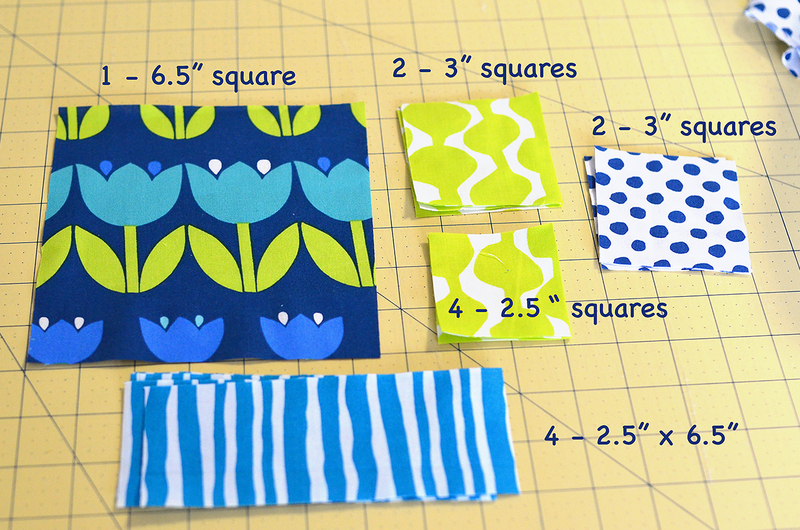 From the light aqua floral print, cut four 2" squares for cornerstones. 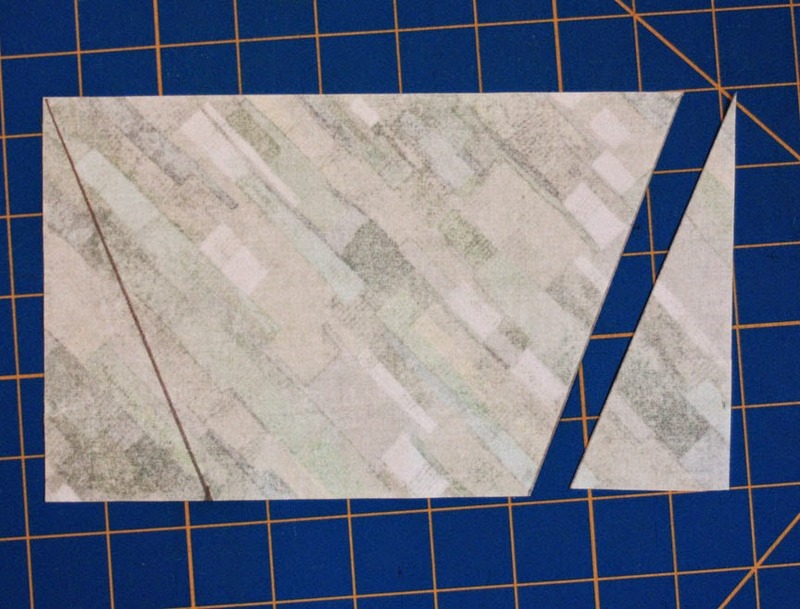 From the remainder, cut two 10" x 15-1/2" rectangles for the pillow backing. 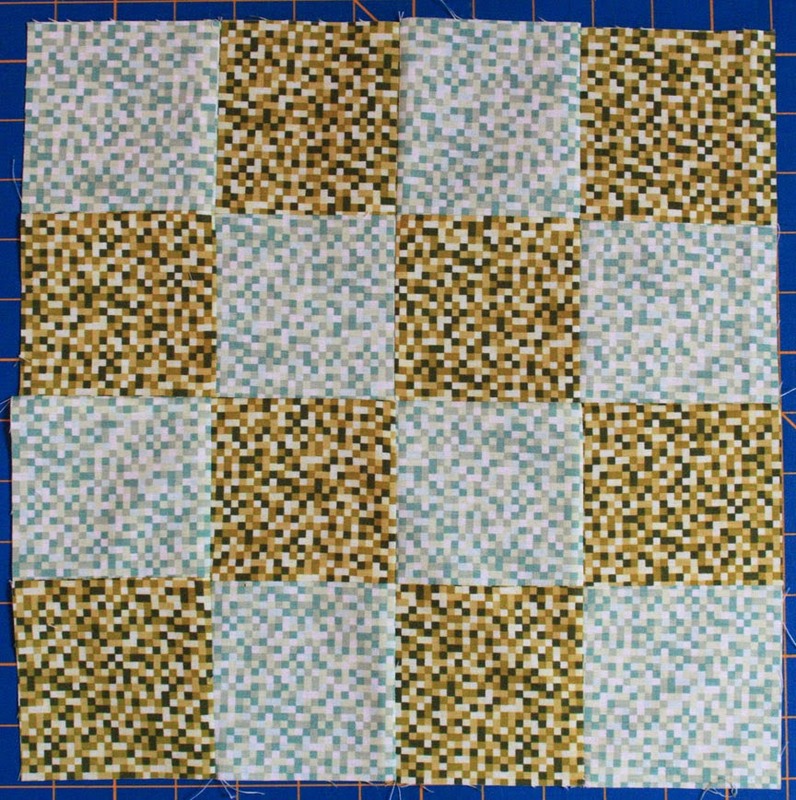 Sew two 2" x 12-1/2" check border strips to the top and bottom of the block. Sew 2" light aqua floral squares to both ends of the remaining check border strips. 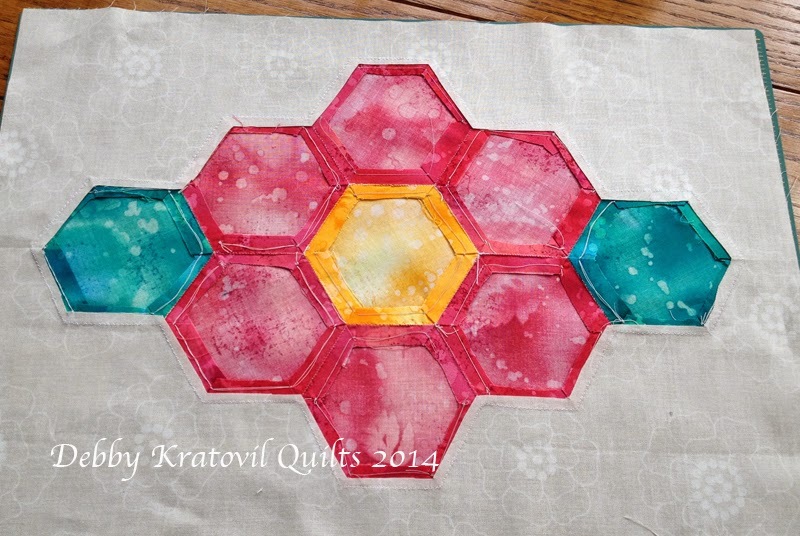 Sew these pieced strips to the sides of the block to complete the pillow top. 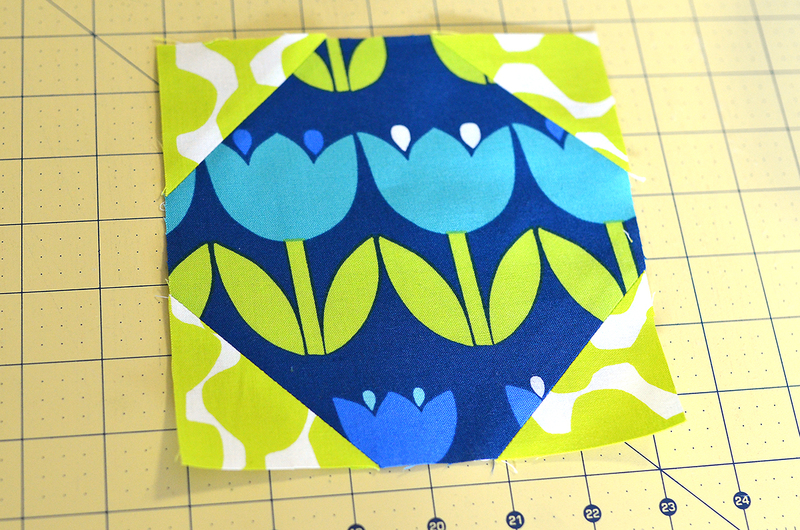 Fold one long side of a 10" x 15-1/2" light aqua floral rectangle over 1/2" and 1/2" again. Press. Topstitch to secure. Repeat on the second rectangle. 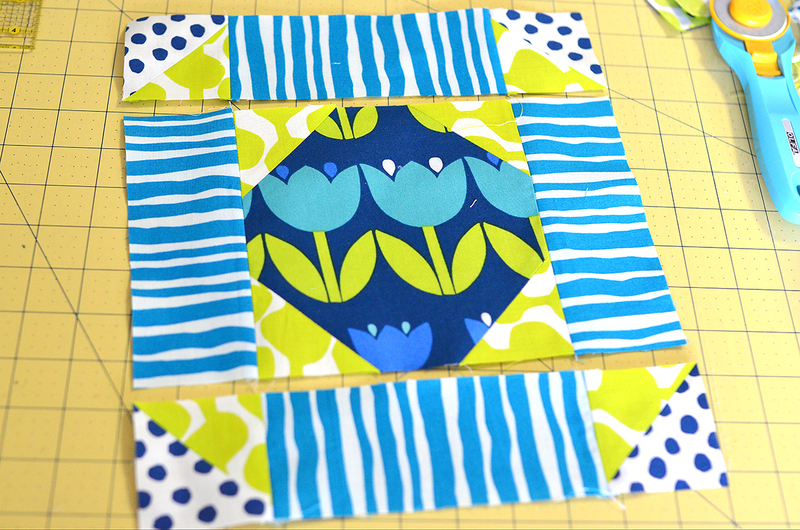 Lay the flower block right side up and overlap the two hemmed rectangles on top, matching raw edges. Pin in place and stitch around all four sides using a 1/2" seam allowance. Turn right side out and insert a pillow form. You're done! 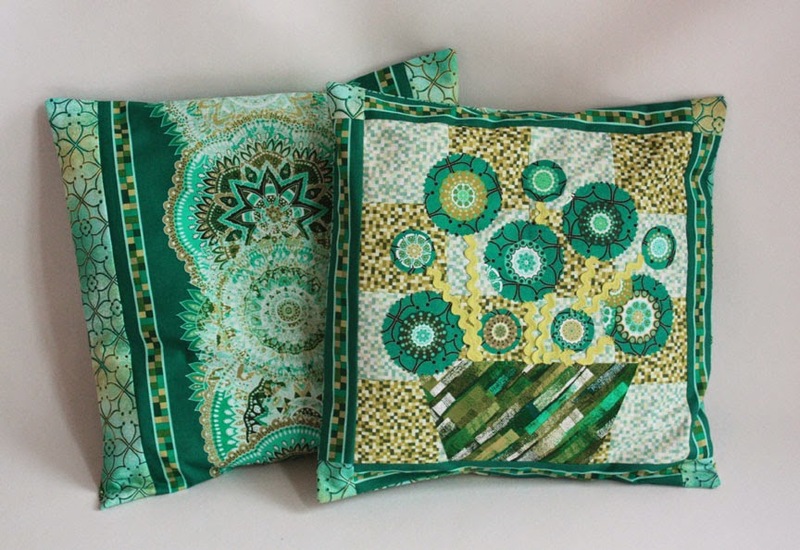 And...as a bonus, visit our Sew Interesting Facebook page for directions to make the coordinating pillow, which uses more of the large medallion border print that we cut the check border from for our flower block. For a chance to win a fat quarter bundle of Palazzo, leave a comment letting us know that you follow our blog (you can sign up via email or a blog reader in the right hand sidebar). 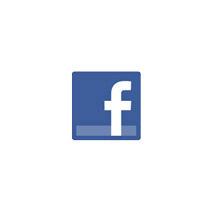 For a second chance, follow us on Facebook and let us know that you do. 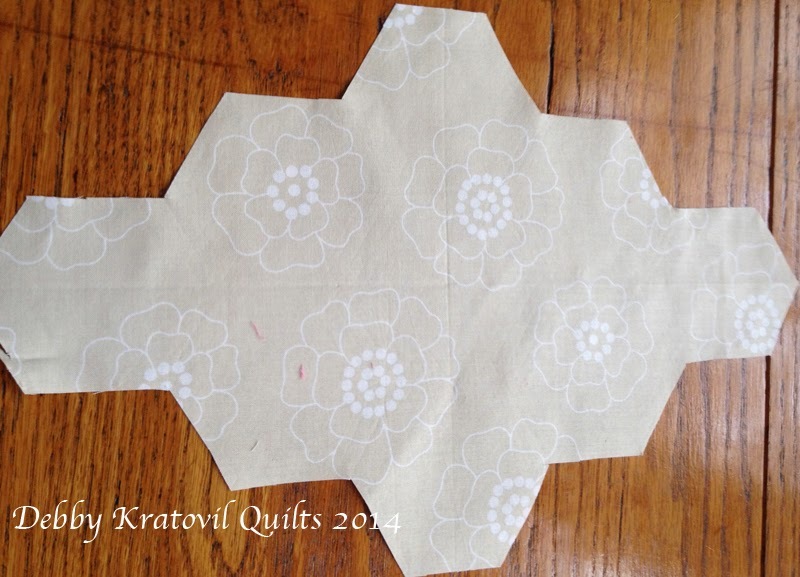 Also, let us know if you're a fan of applique or if you stick to straight piecing. Giveaway is open through Tuesday, May 6 at 11:59 PM EST. 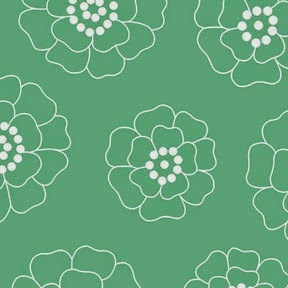 Don't miss the other tutorials featured in our Flower Favorites Blog Hop! Hello! We're back with Day 2 of our Flower Favorites blog hop. 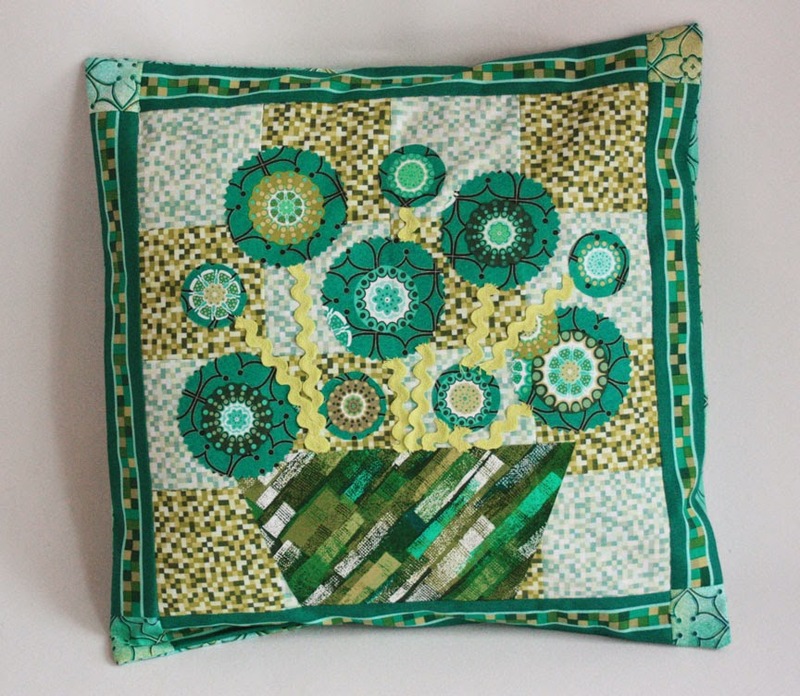 We're featuring blocks made with flower fabrics and/or blocks that are themselves flower-themed. We're excited to share these tutorials with you, and hope they'll inspire your next quilt, wall hanging, or table runner! 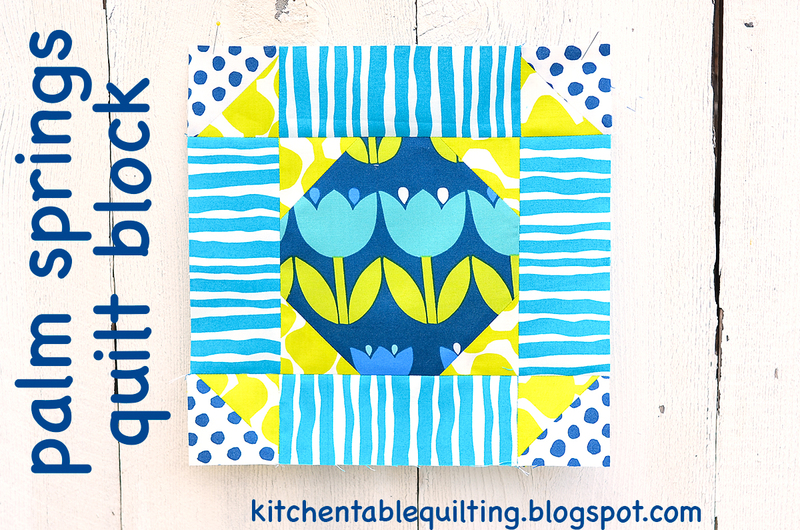 Today, Erica from Kitchen Table Quilting is sharing a bright and cheery block she made using 4 prints from Contempo's Palm Springs collection. This block can't help but make you smile! Enjoy Erica's tutorial and then head over to her blog to see how you can enter to win some fabric for yourself! I was really excited when I got an email asking if I wanted to participate in a floral-themed blog hop. Especially when I saw this fabric line, Palm Springs. 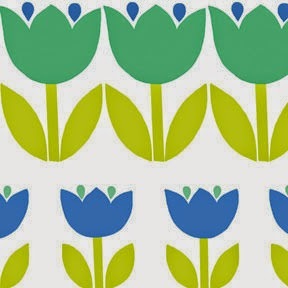 Since the color blue and tulips are two of my favorite things, this collection was perfect. 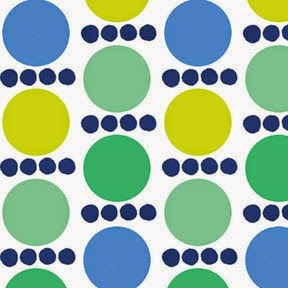 Plus those blue dots are such a fun low volume background fabric. 1. 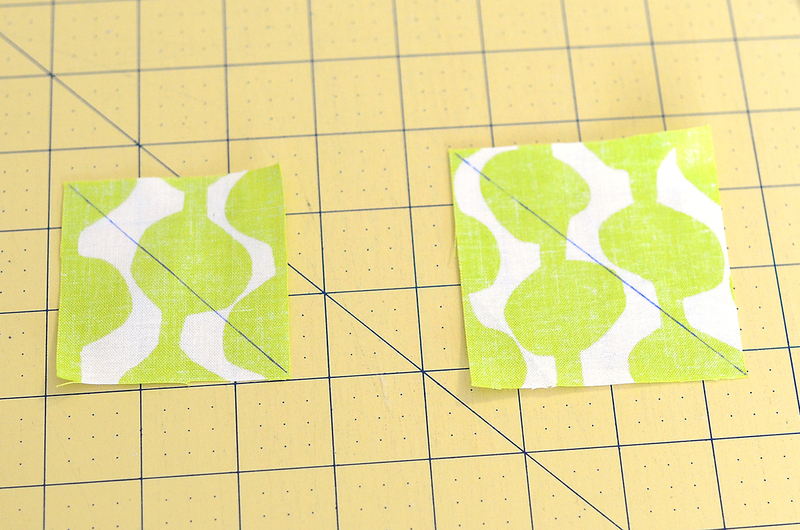 Using a washable pen, mark a diagonal line across the wrong side of the 2.5" and 3" green squares. 2. 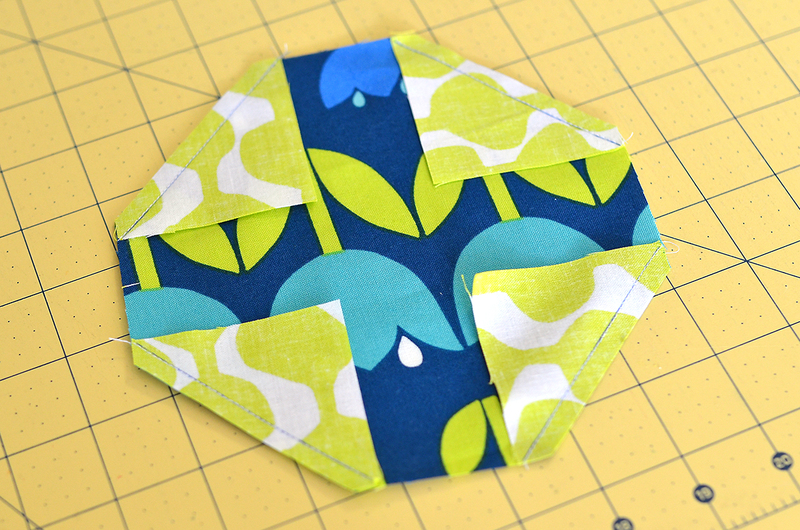 Pair the 3" green squares with the 3" blue dot squares to make them into half square triangles.. Place them right sides together, with the green print on top so the diagonal line is visible, and sew a line 1/4" from both sides of the drawn line. 3. Cut along the drawn line. 4. 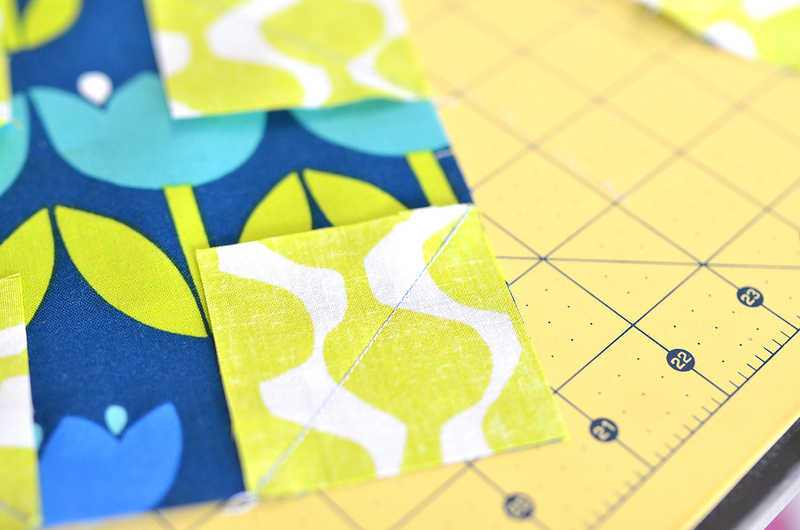 Press the seams open and trim the block down to 2.5". 5. 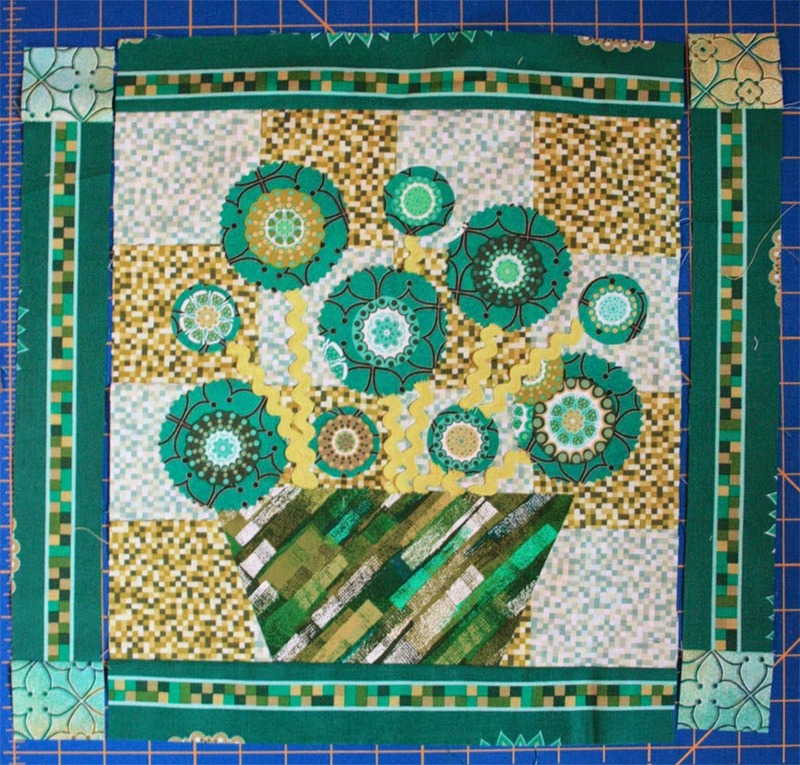 Place the 2.5" green squares onto the corners of the focus fabric square right sides together and sew along the drawn line. 6. Trim the seam allowance to 1/4". 7. And press the seams open. 8. Piece the half square triangles to each side of 2 of the striped pieces and sew the remaining striped pieces to the focus fabric. 9. Piece the top and bottom strips to the main piece. This creates a 10.5" unfinished block. I didn't want to wait to put this block to good use so I added some borders and quilted it up so that I could place it on the end table in our living room. Thanks Erica! 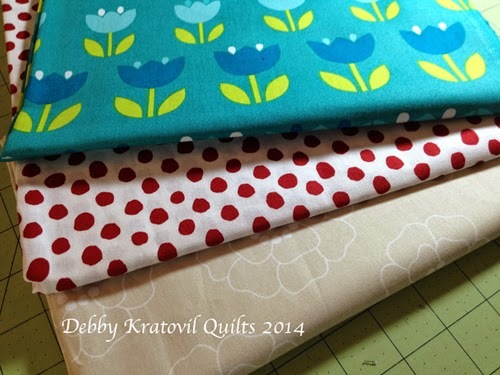 Love your little quilt--those polka dots make a great border! Welcome!! 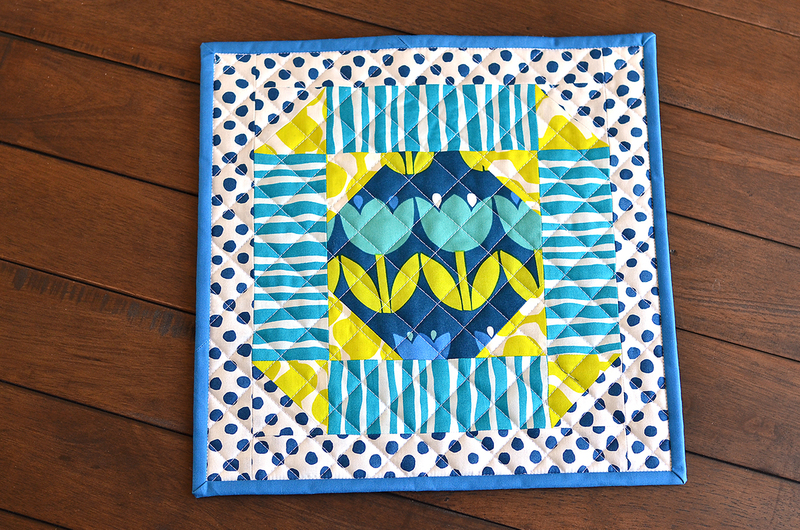 We're celebrating spring with a Flower Favorites blog hop, featuring blocks made with flower fabrics and/or blocks that are themselves flower-themed. We're excited to share these tutorials with you, and hope they'll inspire your next quilt, wall hanging, or table runner! purples and pinks, and - well - all of it! something would hit me eventually. and two other fabrics which will become sashing and border. stitch in the folds at the corners. Background is cut 12-1/2" x 18-1/2"
for stitching. How did I stitch it? to remove the basting. Saves time! And how does it look stitched? 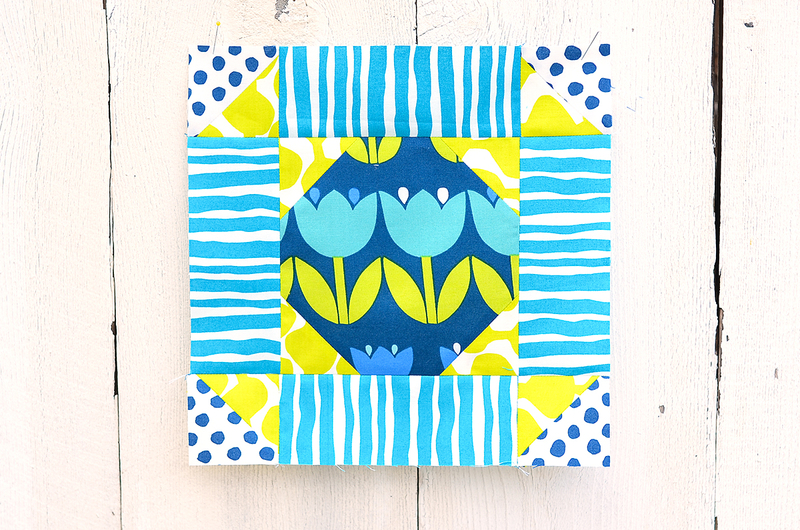 to visit Sew in Love with Fabric each day this week for another inspiring flower block tutorial. With the time-honored Kentucky Derby just one week away and our Flower Favorites Blog Hop beginning on Monday, it's the perfect time to share Southern Charm with you. 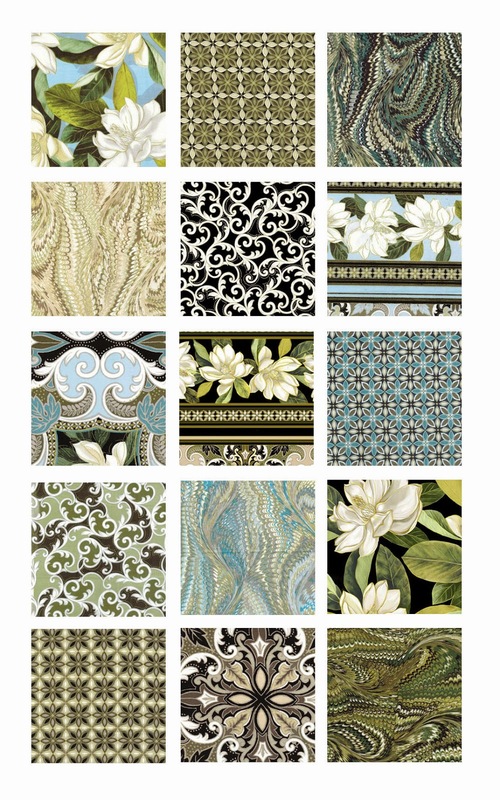 Designed by Maria Kalinowski for Kanvas, this stunning line features the grace and charm of the South: gorgeous magnolias, leafy scrolls and delicate foulards, plus a few coordinates that add dimension to such classic beauty. Looking at these prints, can't you just picture yourself sipping a mint julep while sitting on the porch of a Gone With the Wind-era plantation? 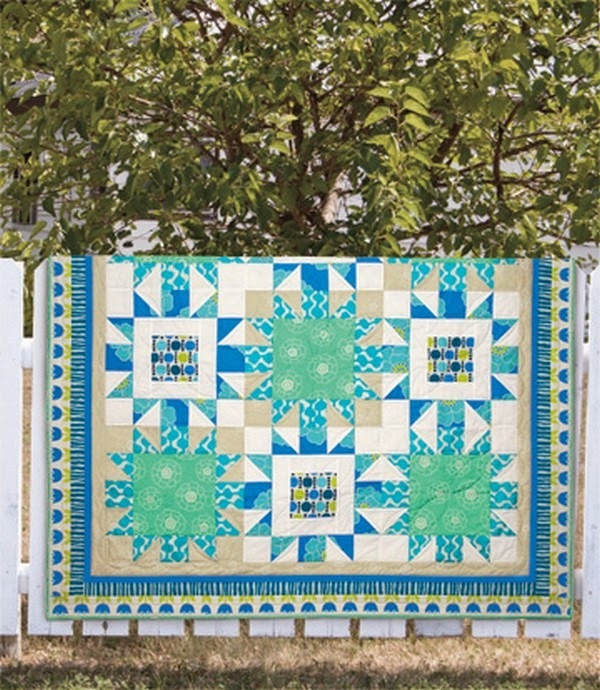 Don't miss the free quilt pattern featuring Southern Charm! Stitched Together Studios used fussy cut magnolia medallions and a variety of the coordinating small prints to create Woodmere, a contemporary design that pops (and is easy to make!). 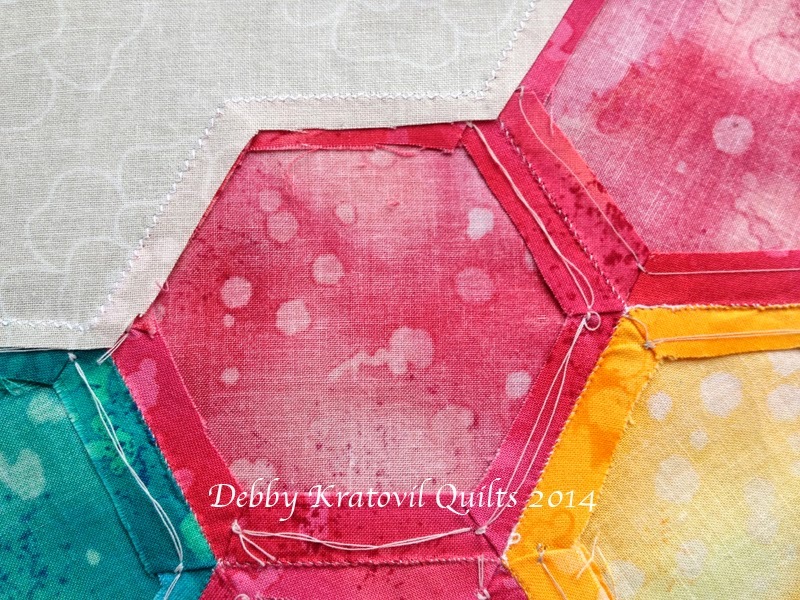 As a quilter, have you ever said, "I want my space"? While we'd all like a little more room for sewing and storing fabric, that phrase has a different meaning as the name of one of our new fabric collections. As in outer space. and cool gradating star prints. 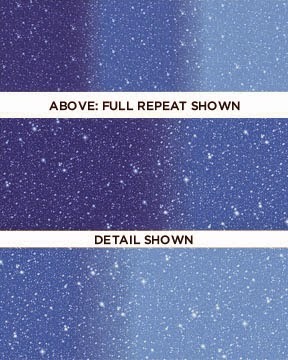 What makes the I Want My Space fabrics so appealing? gradated star prints. 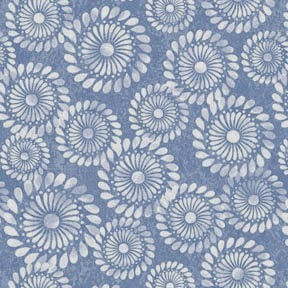 Another great thing about these fabrics is their size...they are 58" wide, which opened up more design options for me. 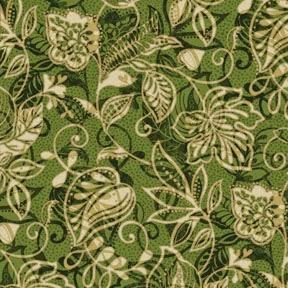 Can you talk about how you used the gradated fabrics? They really make the quilt. By carefully placing the lights and darks in the gradated star fabrics I was able to achieve a lot of dimension and movement. The shadows and highlights of the lights and darks gives the outer borders a three-dimensional feel. What do you envision it being used for? 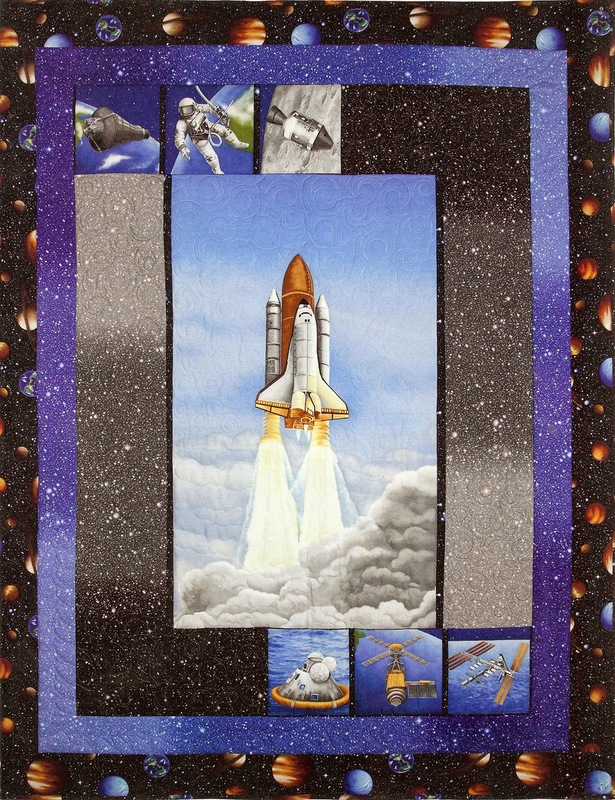 I think it would be a perfect focal point as a wall quilt in a little boy's room, or would make a great toddler bed quilt for a child who dreams of visiting the stars. Any tips for fussy cutting the panel and squares? I like to press the panel using some spray starch before I start cutting, as it helps the pieces keep their shape and prevents the edges from raveling. And always measure twice...cut once! Take your time and be sure that your motif is centered before you engage your rotary cutter. What is your favorite part about the quilt? (a single weekend...or even less!) but because of the great fabrics it looks like you spent much more time! 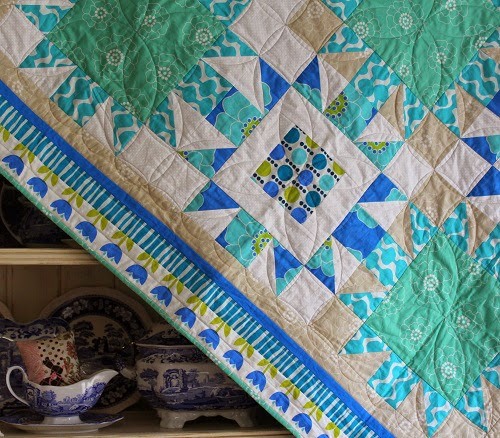 My mom, Linda Leathersich, did the long arm quilting on this quilt and really brought it to life. She outlined all of the panel motifs to make them pop, and then used an edgy swirl in the background to add movement. The blue border has a really modern angular spiky design, and in the outer border she outlined the planets and added stars to bring the whole design together. See the entire I Want My Space collection here. 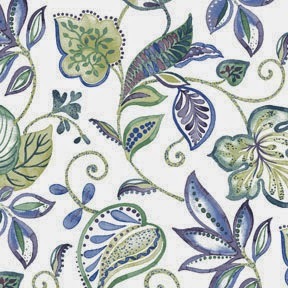 In honor of Earth Day, we're sharing our botanical-inspired collection, A New Leaf by Mitzi Powers. 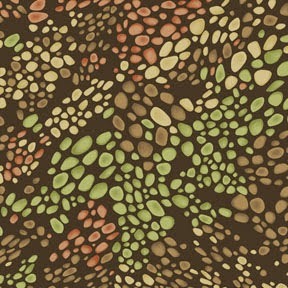 Swirling leaves, pebbles, ferns, all with a watercolor feel...it's just beautiful! 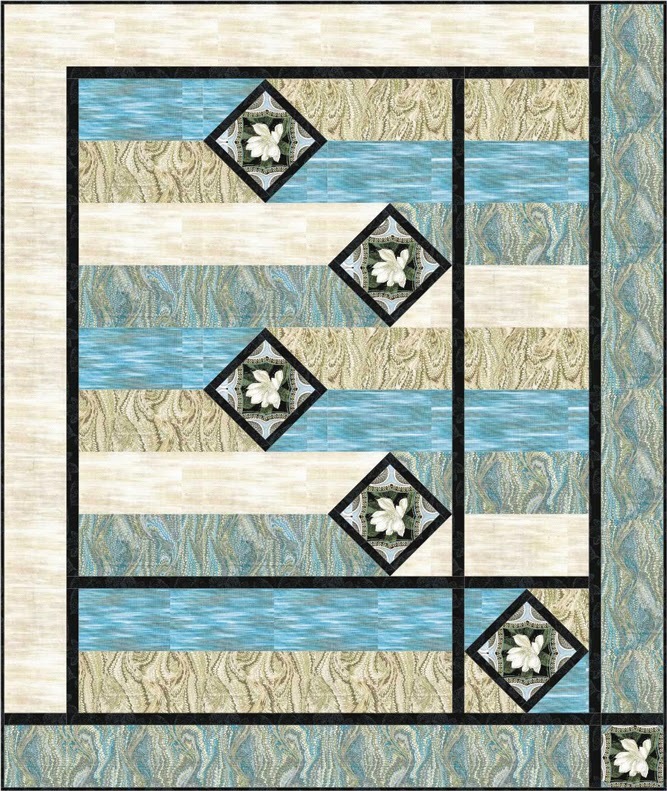 Diane Nagle designed Tranquility, a free quilt pattern, using A New Leaf. Check out how she used the stripe in her setting triangles--talk about letting the fabric do the work! 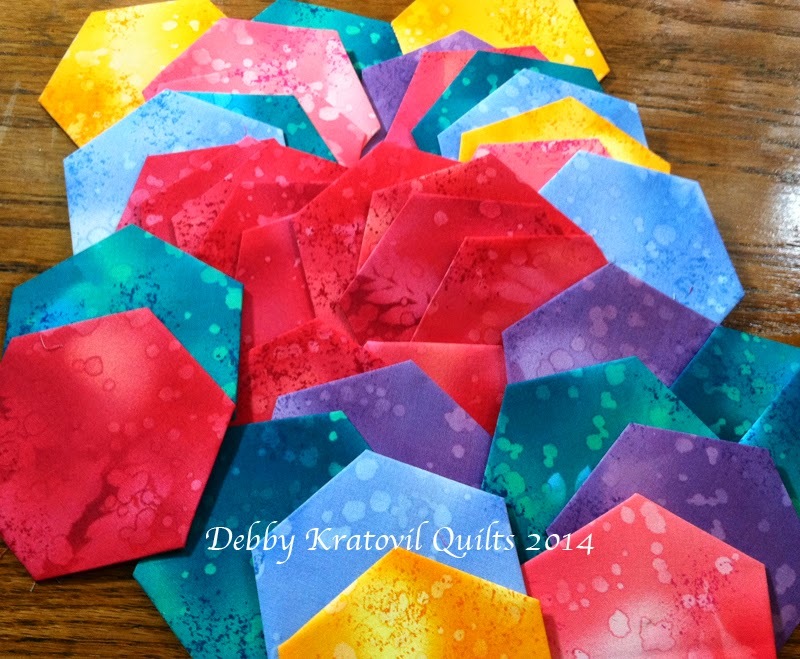 Download the pdf for the free quilt pattern here. What's calm, cool and refreshing like a cool glass of iced tea? 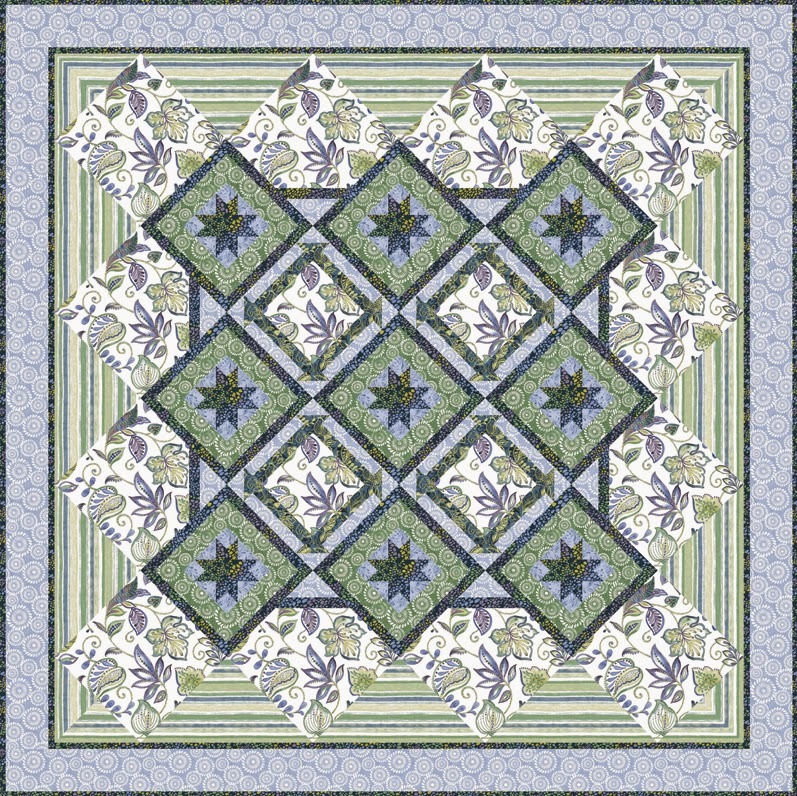 Wendy's "Tulip Time" quilt, featuring Contempo's Palm Springs collection! It's perfect for creating a summertime feeling, especially in this cool colorway. 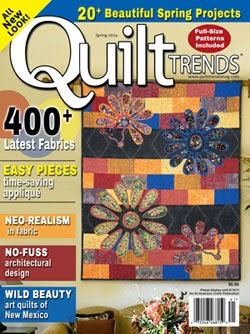 You can find Wendy's pattern in the April/May issue of The Quilter magazine. What attracted you to Palm Springs and what made you choose the cool colorway? Two reasons: First, I like the cheerful and slightly crazy prints in Palm Springs. I normally work with more "serious" fabrics, and I think the contemporary and bright and busy prints in Palm Springs challenged me to get out of my usual box. 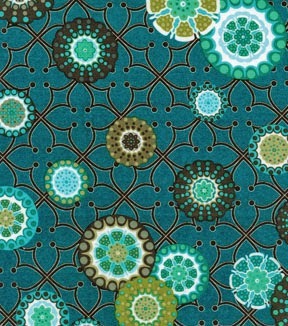 Second, I chose the cool colorway because I liked the aqua tonal fabrics in the collection, and really wanted to do something with it. And of course, I ended using the aqua fabrics as a subdued contrast to the bright dotted print in the collection. 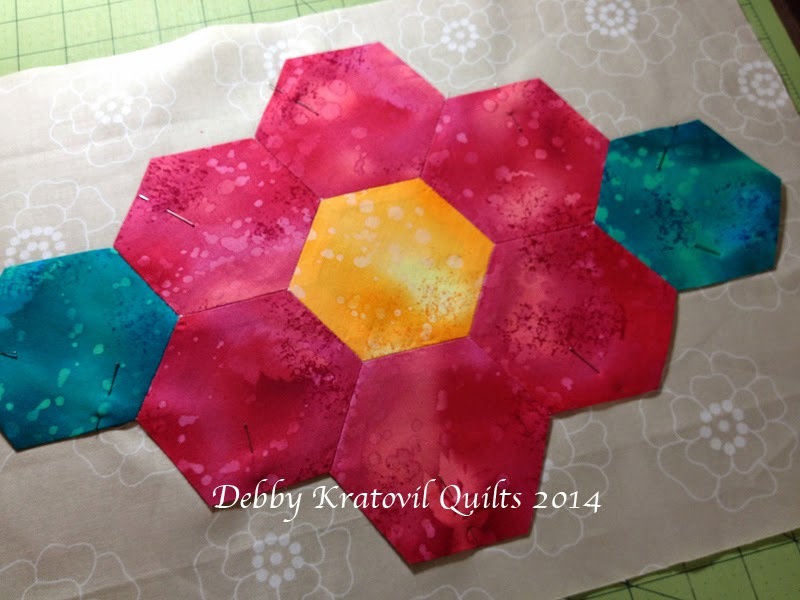 We love the alternating block centers--why did you decide to do the two different versions? Again, it's contrast. I felt like a person looking at the quilt should be immediately drawn by the dots, but then, if the block centers were all dotted, the desired effect I wanted wouldn't be achieved. So, I used the aqua tonal fabrics in the alternate blocks for a "receding" effect so that the dots can shine in the other blocks. Why do you like having the two different background colors? I guess "contrast" is the buzzword for this design. I like even my background to have contrast, so the light taupe and white are perfect. Tell us about that fussy-cut stripe border. That tulip stripe print fabric is one of the most fun stripe prints I have ever used. One could really cut it however one likes. 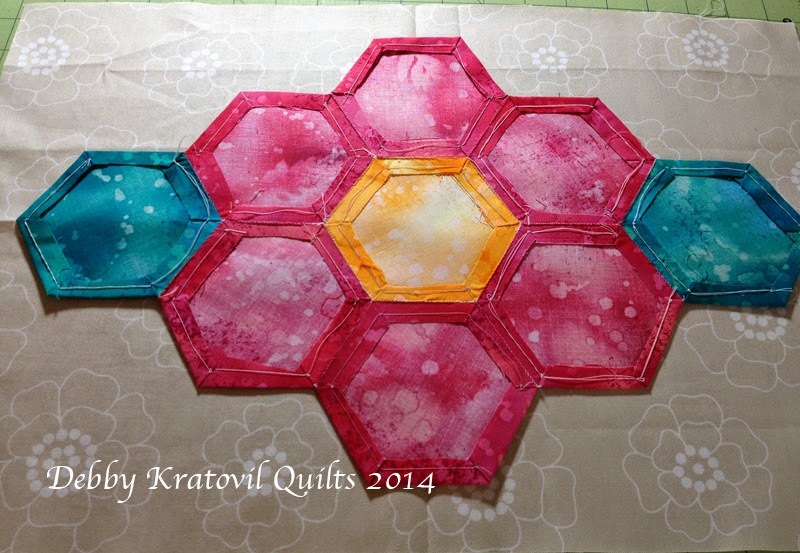 I decided to go for a fussy cut narrower border. And that particular section of the stripe print gave me the perfect width. Though not difficult to construct, I like that the design has a soothing and cool feel to it. 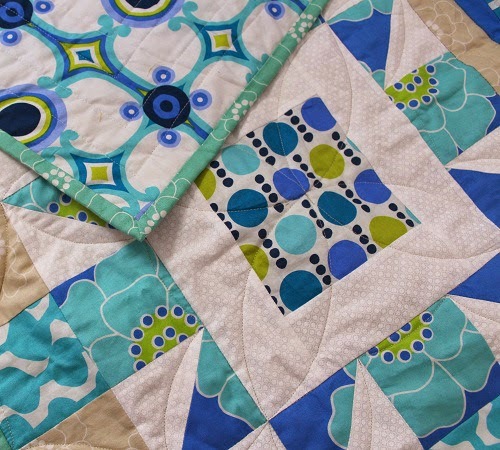 I feel like despite some of the busy prints used in the design, the quilt exudes a calm feel that relaxes my eyes. It was kept simple - orange peels, and straight lines to keep the simple and open feel of the quilt. 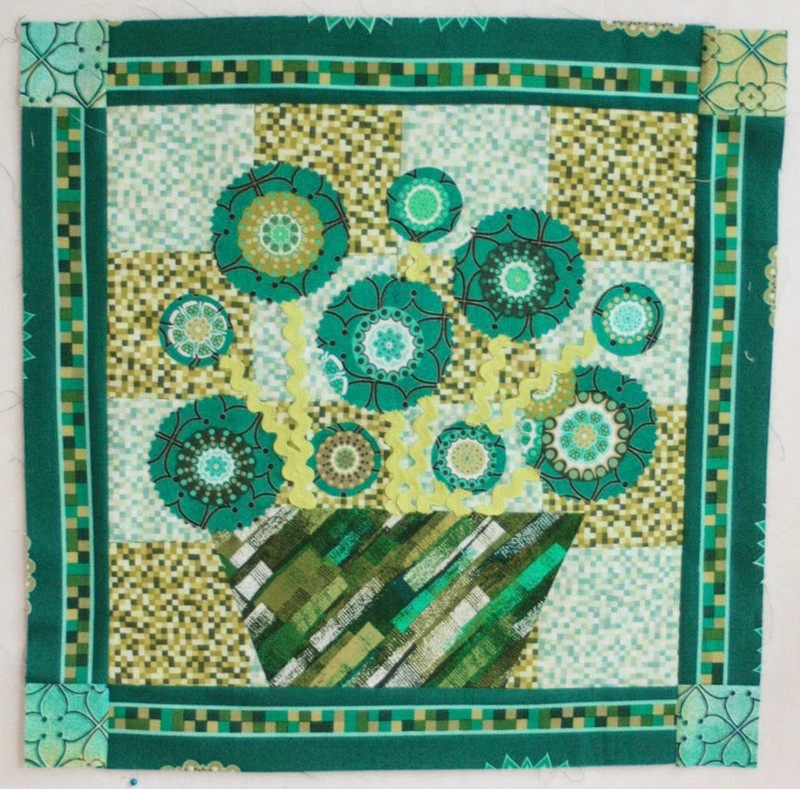 I can definitely see this quilt being used as a throw, or a table topper for a late spring or late summer tablescape. At least that's what I plan to do with mine. 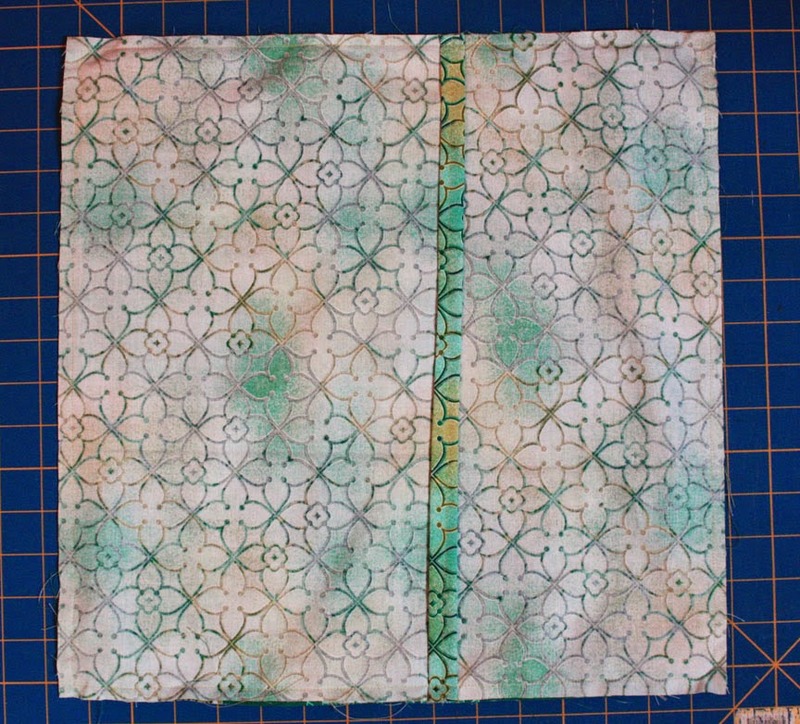 For those wondering about using quilts as tablecloths, I use cork-based placemats in addition on my table so that I keep my quilt/tablecloth stain-free. 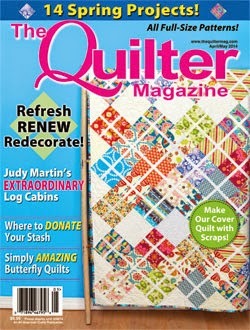 To read more about Wendy's quilt and how she quilted it, visit her blog. See the entire Palm Springs collection here. 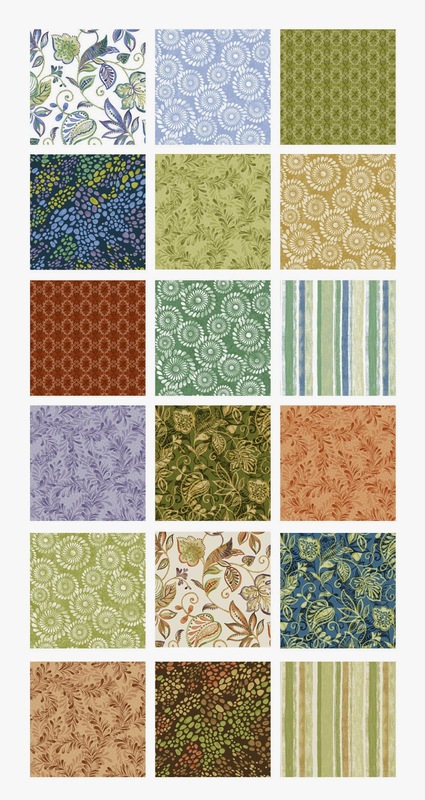 Find the kit for the Tulip Time collection here.